Many hospitals and health systems are exploring integrated Service Lines as a novel organizational model to help bring focus to the diverse services they provide to patients and the various resources (labor, facilities, equipment, materials) they must manage in their relentless striving for ever higher quality and lower cost. 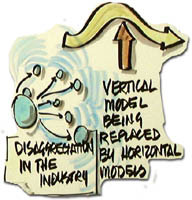 The notion of a Service Line is certainly not new, and there are countless examples from other industries where firms have made the transition from a “vertical” functional model, where resources are organized according to individual professional disciplines, to a more “horizontal” service line or product line model, where resources are directly aligned with the “outputs” that are produced and delivered. Any one of us can easily call to mind large enterprises in many different industries whose product lines have a stronger identity than the overall firm itself. However, to be clear, the primary emphasis in our present context is on the manner in which the diverse resources of the firm are organized to most effectively and efficiently deliver the products and services of the enterprise. Identity and/or brand equity are simply one of the assets that is managed. In the transition to a Service Line orientation, healthcare providers will very often move through a sequence of inquiries as they incrementally define and implement the emerging model, tailoring it to their unique and specific circumstances, challenges and opportunities. Why would we want to move to a Service Line model? What is it about our specific circumstances that suggest a Service Line model would be superior? What advantages would it bring? What difficulties would it cause, or exacerbate? What are our unique opportunities or capacities in terms of clinical, operational or financial excellence, or challenge, that suggest Service Lines as a way to proceed strategically? Do we have best-in-industry care models, or process excellence, or evidence of best results? What other organizations are like us, what have they done, and what can we learn from them? What differentiates our particular strengths, weaknesses, opportunities or threats from existing experiences or illustrations? What is the logical and most motivating model for defining our Service Lines? Can we best approach the universe of patient needs by primary disease type? Are we best aligned by major service or treatment modality, facilities, differentiating equipment or other assets? Is a combination of these best; aligned and integrated for each patient in a context of personalized medical care? Are there specific populations of patients, defined along some useful dimensions, to inform our service delivery or resource deployment? How do we explicitly assign or allocate individual delivery events into one or another Service Line? What is the fundamental unit of assignment (e.g. a single case; a single encounter; an episode spanning admissions; longitudinal courses of care)? How do we address conflicts or overlap, where multi-disciplinary care or complex cases suggest more than one Service Line has a legitimate claim? How are the resource and financial alignments defined and measured? What specific metrics do we use to direct our investments and measure the performance of those resources and the return on those assets? How do we devise a metrics strategy that integrates and leverages the complementary perspectives of clinical, operational, financial and administrative objectives? How does our metrics structure address and accommodate the structure of our enterprise (e.g. health system, hospitals, ambulatory groups, key stakeholders)? How do we assess comparative analysis and performance, both internally and externally? What are appropriate and useful benchmarks? How do we organize our Service Lines? What model do we adopt (formal divisional, matrix, task force, hybrid)? How, in what form and to whom do we institute roles, authority, and accountabilities, and for what scope of mission and resources? How do we ensure clinical, operational and fiscal perspectives and guidance? What differences are necessary within or between facilities and other entities? What communications and information systems are needed? What incentive structures and programs are needed? Where and in what form will we encounter resistance? What obstacles does our plan anticipate, and how will we overcome them? What limitations exist within our existing enterprise structure or resource base, and how must we address them? What forces are working in favor of the needed change, and how can we invigorate those efforts? How will or must the focus, structures, resources and metrics change over time, and how do we anticipate and facilitate these challenges and opportunities in an evolutionary manner? How should we characterize the various individual Service Lines from a portfolio perspective; and how do we establish and implement appropriate investment strategies and accountabilities for individual Service Lines at their position in their life cycle and in the overall portfolio? What benchmarks or metrics can we adopt to enable an appropriate comparative assessment, both within the overall enterprise portfolio, and in our specific competitive context? Building out integrated Service Lines is more than simply clarifying the operations of existing departments and specialty-focused medical services. Trying to do better with a traditional alignment by professional specialty or discipline will likely not provoke the kinds of challenges to existing authority structures, realignment of complex multi-tiered cost allocations, and performance incentives needed to bring transformational improvements in quality and financial return. The process must begin with a laser focus on patient outcomes and experience, and propagate backward to the fresh look that is required to evaluate the needed investments in the full context of distinctive strengths and competencies, competitive threats, market position, evidence of superior (actual or prospective) performance, demonstrable resources and capacity, and the strategic commitment to make it happen. Inform and empower leaders, strategists and decision makers at every level: enterprise, hospital, service line, care setting, department. This entry was posted in Business Intelligence, Enterprise Information Management (EIM), Healthcare and tagged Healthcare, healthcare data, healthcare IT, healthcare service lines. Bookmark the permalink. Would a horizontal model be more appropriate when pushing for an interdisciplinary healthcare team?